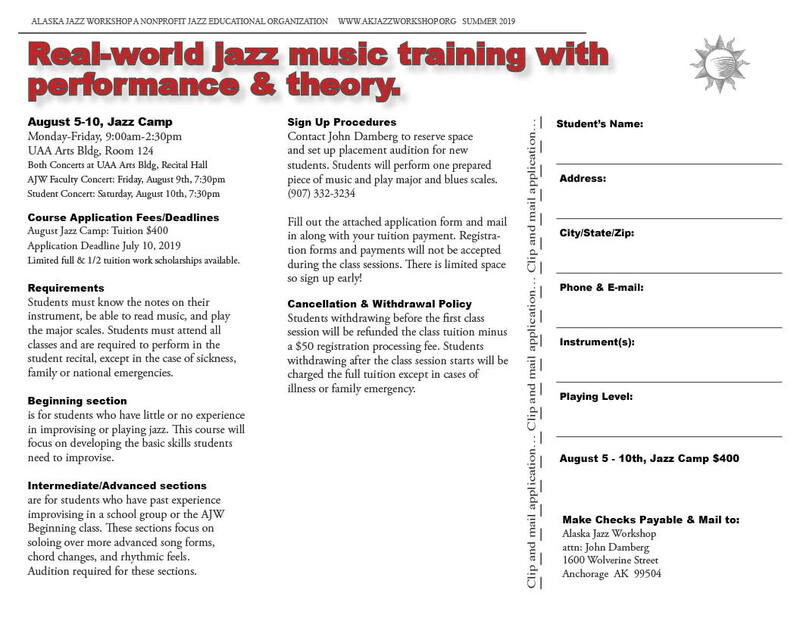 The AJW August Summer Jazz Camp features internationally acclaimed guest artists and Alaska Master Jazz Artists mentoring with grade 7 through adult music students to explore the exciting world of music improvisation over Hot Swing, Blues, Funk, and Latin grooves. Beginning to advanced level ensembles are offered. Classes are held from 9 a.m. to 2:30 p.m. Monday through Friday at the UAA Fine Arts Building. 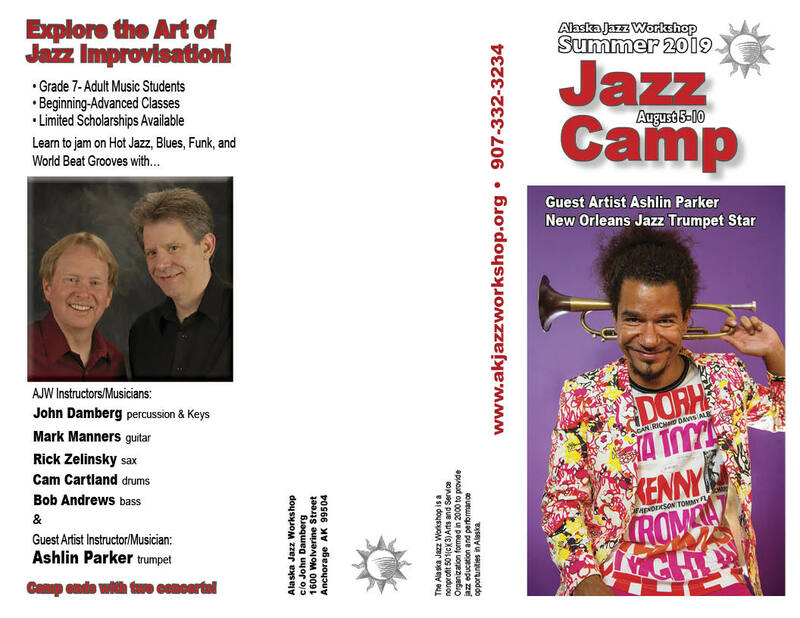 Students receive at total of 25 hours of instruction in small combo settings of 5-9 members. 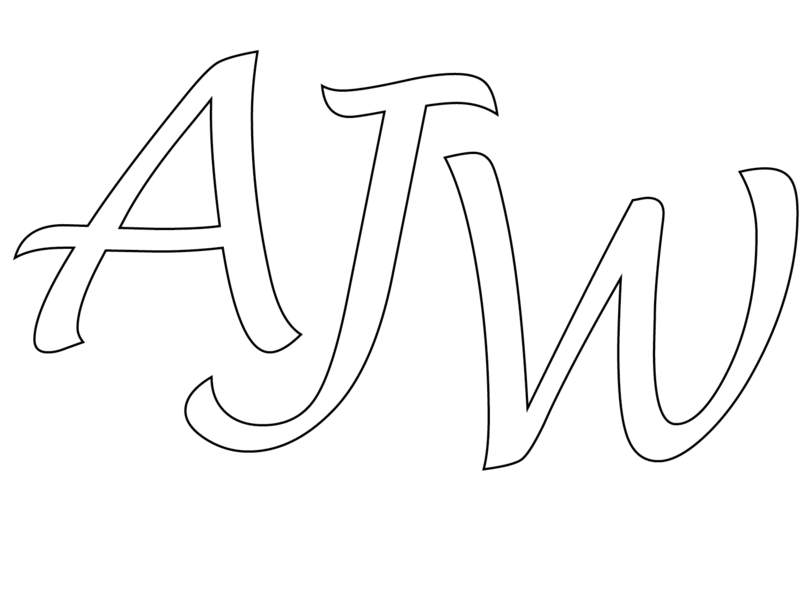 Student groups are featured in a Saturday evening Student Recital and the guest jazz artist is featured in the Friday evening AJW Faculty Jazz Ensemble concert. Classes and concerts are held at the UAA Arts Building. 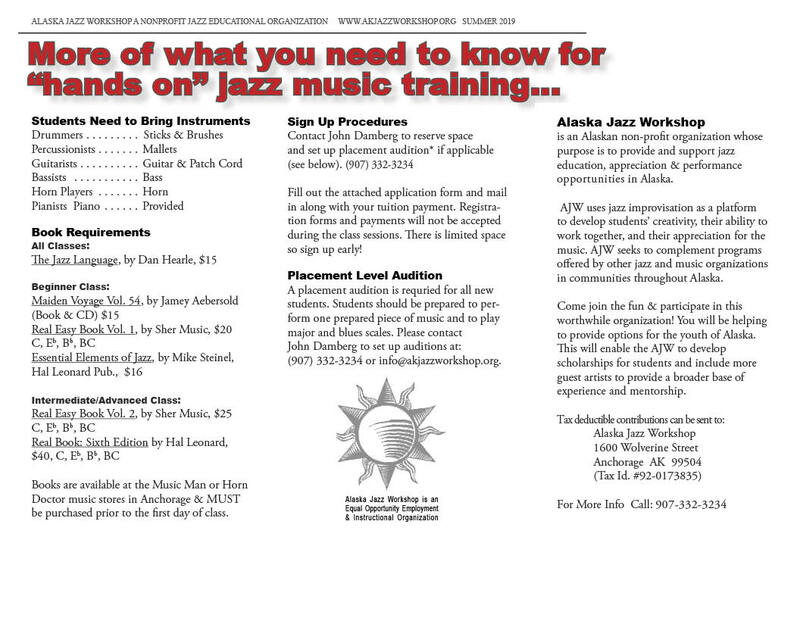 Alaska instructors include: John Damberg and Mark Manners. Alaska guest instructors have included George Pierce, Karen Strid, Cameron Cartland, Yngvil Vatn Guttu, Rick Zelinsky, Bob Andrews, Dirk Westfall, Dan MacElrath, Andy Mullen, Kerry Maule, and George Mancini. Advanced Section will focus on developing song repertoire in a wide variety of styles including: jazz, Blues, Latin, funk, pop,etc. Students will build song repertoirie through reading music, rehearsing as a band, listening and transcribing songs, and through exploring and expressing their inner vocabulary on their instruments. Weekly assignments will be given to promote learning new vocablary, song repertoire, and developing improvisation skills.